Independent Directions to this Site: From Highway 417 (The Queensway) take exit 121A to Bronson Avenue. Avoid doing this during rushhour! Proceed SSE on Bronson 0.4 km to Carling Avenue and turn right or southwest onto it. Proceed 0.6 km to Preston Street and turn left or south onto it. Drive 0.1 km to the T-junction and turn right or southwest onto Prince of Wales Drive. Go 1.0 km (0.4 km past the traffic circle) and turn left or ESE into the entrance of the Fletcher Wildlife Garden at the Central Experimental Farm. Rideau River West Side Route Directions: From The Arboretum parking lot, return to the traffic circle on Prince of Wales Drive. Turn right into the circle and go 270 degrees or three-quarters the way around it to head southwest on Prince of Wales Drive. Go 0.4 km and turn left or ESE into the entrance of the Fletcher Wildlife Garden at the Central Experimental Farm. Site Description and Birding Information: This fairly recent initiative is an attempt to return a portion of "the farm", as the Central Experimental Farm is fondly known, to native vegetation. The Ottawa Field-Naturalists' Club has undertaken this as a longterm project. The club and the Friends of the Central Experimental Farm have combined to do a tremendous amount of volunteer work to meet this aim. The Bill Holland Trail traverses Fletcher and takes you through each type of habitat represented. There is a feeder here behind the interpretive centre at the end of the road and another in the old woodlot. The gully to the south of the building is a great spot for migrants and early winter hangers-on. This site will no doubt get better as it reverts to a more wild state. 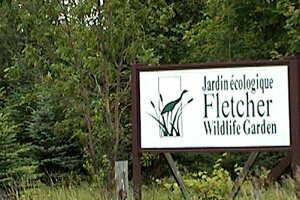 Check out the Fletcher Wildlife Garden website and their page on birdlife at the garden. Northern Mockingbird has bred on the Central Experimental Farm just to the west of the Arboretum. One was seen at Fletcher on May 13, 2005 and at the nearby Arboretum on May 11, 2005. One was also seen at Fletcher on Apr. 24, 2006. Great Gray Owls visited this site twice during the "Invasion" of 2004-05. One on Dec. 17 - 19, 2004 and one Jan. 24, 2005. From Nov. 21 to at least Nov. 29, 2007, one or two Dark-eyed "Oregon" Juncos hung out here. Rideau River West Side Route Directions: From the Fletcher Wildlife Garden road, return to Prince of Wales Drive. Turn left or south onto it and go 0.4 km to a road on the right. Turn right or west onto this road and enter the next site on this route, the Central Experimental Farm. Return to Rideau River West Side. Return to Birding Ottawa Table of Contents.